The story behind the development and a deeper dive into The Power BI Project by our Cloud Offering Manager, Morten Reinhardtsen. My role here at Ironstone, as the Cloud Offering Manager is to develop, deliver, optimize and evolve our services to the business needs of our customers. I’m always looking for the employee, solution or partner that gives us an edge in a very competitive market. Together with Printix we at Ironstone have created a free Power Bi Dashboard available for all partners of Printix that will add more value to all businesses using the solution. This job would never be possible without a team, after all, it takes a team to make great! I therefore want to start this post by saying a huge thank you to every single person at both Printix and in Ironstone that’s contributed to making this solution. You’re great! If you haven’t read our press release about partnering up with Printix on creating an awesome, open source, Power BI solution based on metrics and insights from Printix, you should head over HERE - 'The Power BI Project'. Last summer we spent days on days testing different print management solutions, trying to find the key solution to delivering print management optimized for the modern workspace. This was a tedious and disappointing task, as we discovered that none of the big print management providers was ready for the modern Workspace. Our disappointment turned into a feeling of euphoria when we discovered that Printix provides a serverless, simple and secure print management solution, where you pay per user, per month, that even integrates directly with Azure Active directory! This is perfectly aligned with our serverless, modern workspace solution - Best Place to Work. One of the major benefits of partnering up with a modern partner, such as Printix, is the ability to develop new and exciting features, that brings business value, in a much faster phase than earlier. A key value for Ironstone is to deliver up to date, automated documentation and analytics, 100% transparent to our customers. After all, it’s your data, we are just proud that you allow us to manage it! With a traditional print management solution, we would never be able to accomplish what we have accomplished with Printix; Delivering customers business added value, based on analytics of their print management solution, updated daily! A common challenge for a managed customer has often been to get insights into their own data. We in Ironstone want to battle this common problem and offer our customers the documentation and insights they deserve! This of course includes insights into their print management solution. Do you know if your print vendor follows up on your service agreement? Is the printer in use? Who prints on the printer? Do I need to order toner? How many printers and print users do I have? For many customers, these answers have remained unanswered. Especially if you have a mixed print environment, with different vendors. But not anymore, not when your partnering up with Ironstone and Printix! Our solution to the problem was creating a Power BI dashboard, available for free. Not only to our customers, but to everyone! We are a different kind of solution provider, and we want to contribute back to the open source community, after all, we all get a lot of help, solutions and insights from the community. It’s just right that we contribute back to it. A Power BI solution Template. A Printix API PowerShell Wrapper. A PowerShell script that extracts data from the Printix API and stores it in an Azure blob storage container. A set of PowerPoint design templates and icons. A set of example data you can work with. The Power BI solution template is the Power BI report you want to publish to powerbi.com and share with your customers, colleagues and maybe even your print vendor. It’s stylish and contains many of the metrics you have always wanted. Such as looking at the metrics for a specific printer. 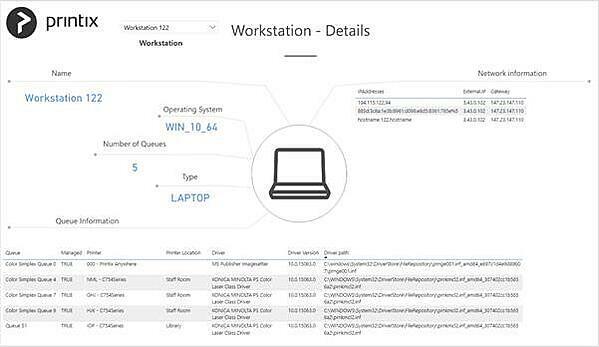 The Printix API PowerShell Wrapper and the PowerShell script extracts data from the Printix API and publishes the extracted data to an Azure blob storage account, making the data available for use in PowerBI. 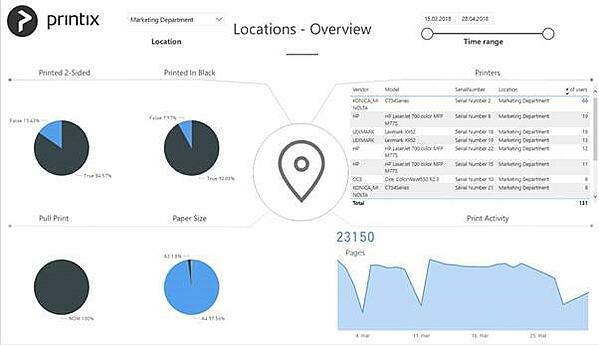 Allowing us to create beautiful dashboards, where you can get insights into the print usage per location. While the PowerPoint template allows you to easily change the current design template to fit your needs, it allowed us to create graphics that gives you insights into any workstations print queues and much more! We would love for our customers and other Printix partners to contribute with feedback, suggestions, improvements and innovations by participating in the open source project found on GitHub. Hopefully the project will continue to evolve in the future and provide even more value for your business! Maybe we will end up with streaming data into Power BI from the Printix API, removing the need for a storage account? Or maybe we will get advanced trend analytics on our toners usage? There is a lot to improve, so your contribution would be much appreciated, by everyone. Enough writing, I hope you enjoy your print analytics. And if your curious to learn more about our services, don’t hesitate to contact us. After all, we are here for you!